I can’t believe it’s already July – where has the year gone?! This summer has been a little cool, but it’s feeling hot and humid to celebrate the 4th of July tomorrow. We’re having a low-key day at home, lots of swimming and hanging out. I plan on making another batch of these drinks – they were so refreshing and so simple to make! I loved the addition of lime and mint. It really enhanced the watermelon and was delicious. If you want to make it adult friendly, add a shot of rum or vodka for a fun summertime cocktail! Aqua fresca translates to “cool water” and they’re popular in the US and Mexico. They’re a delicious way to enjoy fresh fruit in the summer. I’m planning to experiment and try more flavors this summer. What type of agua fresca would you like to try? Welcome to December’s Secret Recipe Club! I can’t believe this is the last reveal for my group this year. 2014 has flown by! This month my assignment was Learning Patience. I’ve been following Corey’s adventures for some time since we’ve been in the same group for SRC. One thing I love about Corey’s blog is I live vicariously through her travels around Trinidad and now London – it gives me a little sneak peek into life in another country. London is one of the places I want to visit one day. Today’s a big day for me. I start my new job! I’m a little nervous leaving a more than 12 year career in electrical engineer, but I’m excited to take my marketing experience to help build a local company’s brand. 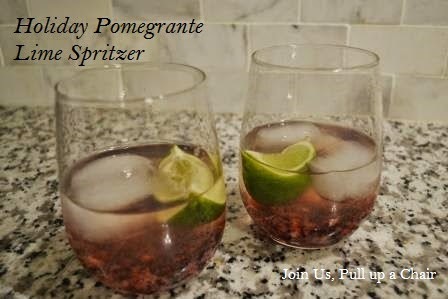 To celebrate this weekend, I decided to make Corey’s recipe for holiday pomegrante lime spritzer. It was easy to make and so light and refreshing. I also wanted to test the recipe for a holiday open house I’m hosting for my business next Sunday. I think all my guests will love it! In a glass, muddle the pomegranate ariles with the back of a wooden spoon. Add in the wine, sparkling water and squeeze in the lemon. Add a few ice cubes and drink up!